GOT DEER? 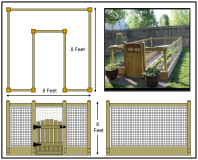 Here is a closed gated garden that can protect plants from deer. This garden can do the job. And I think this could be a do it yourself project! Best part about this garden is when the weather gets cold you can wrap it and it quickly becomes a green house! Roof beams would be required.